This infrared image of Uranus from the W.M. 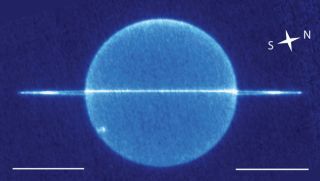 Keck Observatory shows the rare ring-plane crossing in 2007 and is the first image of the unlit side of the rings of Uranus. The Sun itself will cross the ring plane of Uranus on 7 December 2007. Astronomers have captured their first glare-free glimpse of Uranus's rings since they were first photographed more than 20 years ago by the Voyager spacecraft. The new pictures show in unprecedented detail the normally unlit side of the planet's rings and the dust that surrounds them. They might also reveal the presence of new Uranian moons. Normally, these features are obscured by glare from the micron-sized ring particles. The images were snapped by ground and space telescopes as the planet's rings swiveled edge-on to Earth during a rare celestial alignment that occurs only once every 42 years. An analysis of the images, detailed in the Aug. 24 issue of the journal Science, was presented today at the European Planetary Science Congress in Potsdam, Germany. The photos also reveal that the pattern of dust surrounding the rings has changed greatly since they were first photographed by NASA's Voyager-2 spacecraft in 1986. Back then, the dust appeared to be embedded in the rings. In images taken by the Keck II telescope in Hawaii on May 28, 2007, the dust appears as a broad cloud that encompasses nearly all of the planet's dozen or so rings. "People tend to think of the rings as unchanging, but our observations show that not to be the case," said study leader Imke de Pater, an astronomer at the University of California, Berkeley. In fact, one of the inner rings, called zeta, appears in the new images to be several thousand kilometers farther from the planet than when it was discovered by Voyager. "The ring may have moved, or it may be an entirely new ring," said study team member Mark Sholwater of the SETI Institute in Mountain View, California. The researchers hope that with further analyses they will be able to spot some of the small moons that shepherd the debris into distinct rings. They might even discover new satellites that have until now remained hidden. "Two little satellites called Cordelia and Ophelia straddle the brightest ring, the epsilon ring, and keep it in place, but people have always assumed there must be a bunch more of these satellites that are confining the nine other narrow rings," Showalter said. Uranus's rings are so faint that some scientists did not believe they existed when William Herschel, who discovered the planet, first reported them in 1789. The rings were rediscovered in 1977 when they dimmed the light of a star behind Uranus. NASA's Hubble Space Telescope, the European Southern Observatory's Very Large Telescope (VLT) in Chile and the Palomar Observatory in California also trained their eyes on Uranus's rings during the alignment this year. Uranus appeared edge-on as viewed from Earth on May 3r and then again on Aug. 16. Astronomers plan to train their telescopes on the planet again in the days following Dec. 7, when the dark side of the rings will make a brief appearance after the Uranian equinox, when the rings are perfectly edge-on to the sun.